A couple of weeks ago I attended the opening of One Blenheim Terrace in St John’s Wood. This is the first restaurant to be opened by Head Chef Ed Shaerf who previously worked at Gordom Ramsay at Claridges and The Ivy. To hand is a wealth of knowledge as David Moore acts as a consultant for One Blenheim Terrace. David is well known in the restaurant industry as owner of the Michelin restaurants Pied à Terre and L’Autre Pied, and as an inspector on the BBC2 TV series The Restaurant. For the occasion of the opening, the dining room had been removed of most tables and chairs to allow the guests to mingle freely. It was therefore difficult to know how the restaurant is normally laid out. Nevertheless, One Blenheim Terrace appears to be an intimate space with a lovely al fresco eating area outside which would come in handy during the summer. On offer were a canapé selection of items from the menu paired with drinks for our tasting pleasure – starters with beer, mains with wine and desserts with sweet wine. 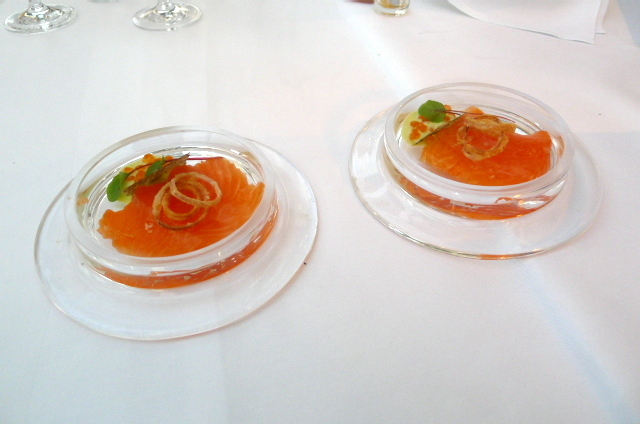 These included an oak smoked salmon (matched with Purity Pure UBU, Warwickshire) which was beautifully smokey. Served with dill, dill emulsion, crispy skin and salmon roe, the salmon was lovely and sweet, and the dill and crispy skin worked a treat. 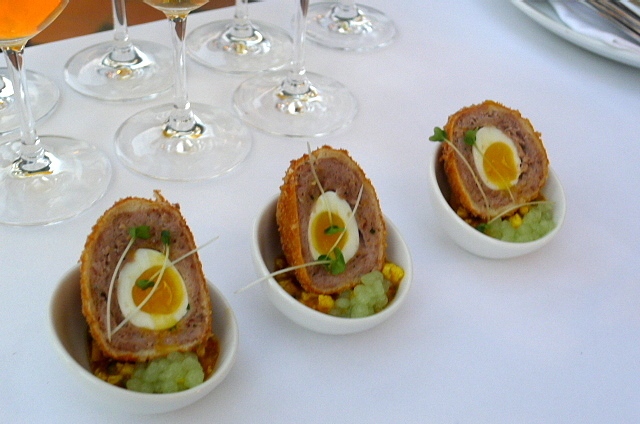 A confit duck and foie gras scotch egg (matched with Odell IPA, Colorado, USA) was well cooked and meaty. It was accompanied by a piccalilli which packed a good acidic punch. ‘Duck à l’orange’, roasted mallard with braised endive, confit leg spelt and orange sauce (matched with 2009 Moss Wood Pinot Noir, Victoria, Australia) was nicely done, and was rustic and flavoursome. However the duck was a little chewy. Baked potato consommé with sour cream and chive froth (matched with Harviestoun Old Engine Oil, Alva, Scotland) was interesting and boasted of a good potato flavour. 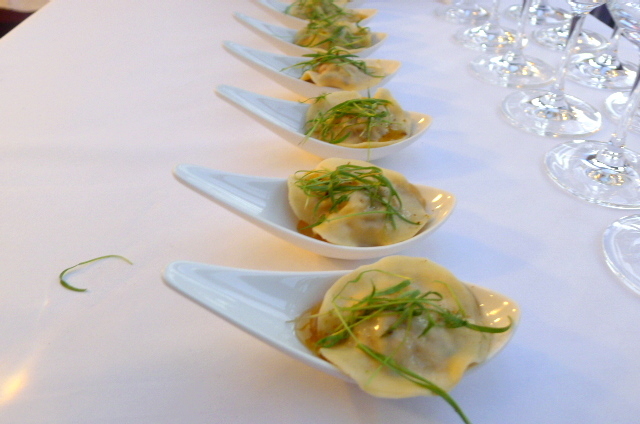 Lobster ravioli with thermador sauce and fennel pollen (matched with 2009 La Crema Chardonnay, Monterey, California) was beautiful and full of meaty lobster. The pasta was well cooked and the sauce was creamy and light. 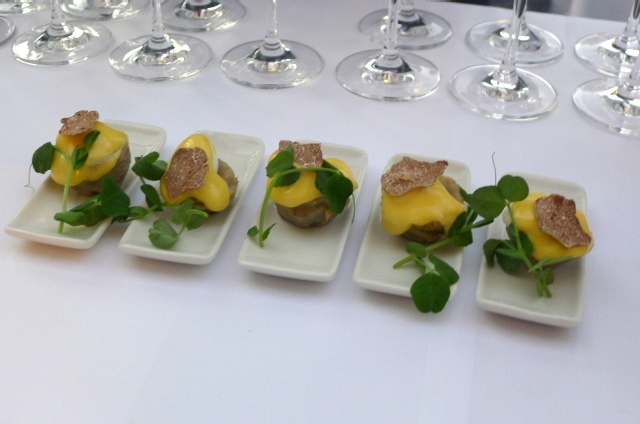 Eggs benedict with white Alba truffle and peashoots (matched with 2010 Hunter’s Reisling, Marlborough, New Zealand) was pleasant and tasty, if a little dull. Rice pudding brûlée with damson jam (matched with 2009 Paul Cluver Weisser Reisling Noble) – a rice pudding with jam and topped with a brûlée crust – was tasty and well balanced. Less successful were the cheddar cheesecake with walnut biscuit, whisky jelly and roast figs; and chocolate crumble and custard (matched with 2009 Elysium Black Muscat Quady and 2007 Royal Tokaji, Hungary, respectively). These desserts had not set properly and the consistency of both of them was too runny. The cheesecake was also a little dull. One Blenheim Terrace presents a menu which showcases old classics cooked with a twist and a modern touch. The savoury dishes were impressive for its stylish cooking and tasty flavours and went some way to illustrate what the restaurant has to offer. 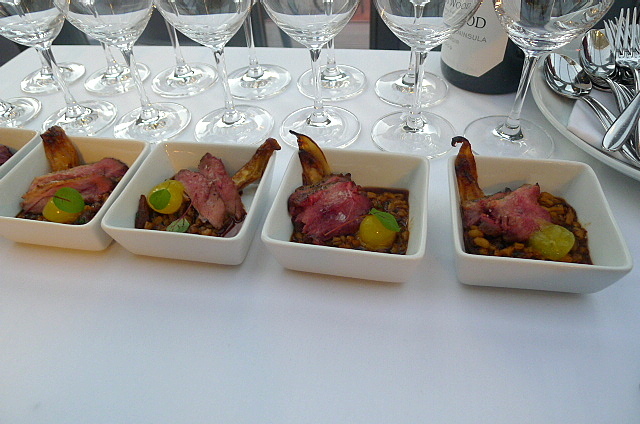 The pairings were also nicely done. One Blenheim Terrace is a new restaurant worth trying. 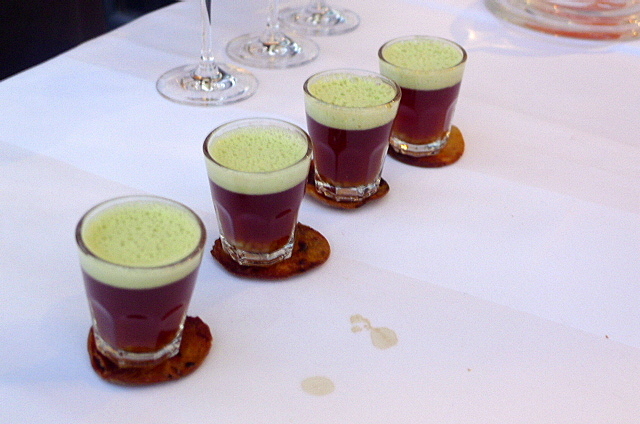 Price range: £28 – £46 for three courses. Excludes drinks and service. Just found this by accident, have checked out their website and will be visiting it asap to dine. Like your blog name, reminds me of my girlfriend who just loves to eat!